Home remodeling projects call for a significant amount of time, money, and effort. If you focus on key aspects of your project, you will find that these will pay off in the end. Renewal by Andersen® of St. Louis, the trusted provider of doors and windows in St Louis, looks at three projects that prioritize specific aspects of home living and benefit you beyond what you pay for. 1. Go for natural lighting. A few window options specifically cater to the promotion of natural light. First among these are picture windows. These fixed windows feature wide clear glass panes. When customized for maximum size or clustered together, these can draw in lots of sunlight during the day. Not only does natural light bring warmth and promote the absorption of Vitamin D; it also lowers your dependence on artificial lighting. 2. Open up to fresh air. Where the picture window remains immobile and cannot open, the casement window opens up its full length. This draws in fresh air, allowing stale indoor air to circulate out. They key consideration here is indoor air quality, which studies by US Environmental Protection Agency revealed to have a strong effect on health. This simple home remodeling in St Louis, MO, can help keep your family safe and healthy. 3. Patio doors for energy efficiency. Lastly, our patio door options are unique because large panes of glass characterize them. This is important as all our products have Fibrex® frames and High-Performance™ Low-E4® glass. Both these materials resist heat transfer and keep temperatures at comfortable levels in your home. A common theme of all these projects is maximizing what nature already has on offer. 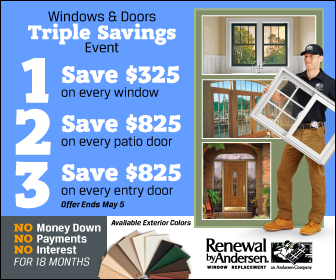 From lighting to temperature regulation, and even freshness of air, Renewal by Andersen of St Louis has the windows and doors that give you all that and the savings they bring. Call us today, and we will even start you off with a free estimate.